"The kids won't complain about dinner tonight when they hear they're having Cola Chicken. Simple and tasty with only a few ingredients." Place the chicken pieces into a 9x13 inch baking dish. Season with salt and pepper. 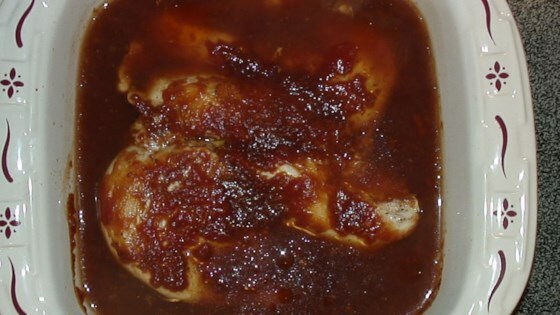 In a medium bowl, mix together the Worcestershire sauce, ketchup and cola. Pour over the chicken. Cover with a lid or aluminum foil. Bake for 50 minutes in the preheated oven, until the chicken is no longer pink. On the UK "Slimming World" diet. My family eat the same main meal as I do, we all enjoyed this, will make again, used only 2 tblspns of ketchup = 2 syns. Served with potatoes & fresh veg. My kind of recipe! Quick and easy for mom, Yummy enough for the kids. They said it tasted like eating chicken nuggets with sauce. This is so simple and very tasty! my daughter loves it! Make sure to stir sauce and turn chicken about every 20 mins,... and cover well! add a salad and veggie, your done!